Kuwaiti Deputy Foreign Minister Khaled al-Jarallah said Iran is against those who insulted the Emir of Kuwait, and will take action against these people. Khaled al-Jarallah, the Kuwaiti deputy FM, was quoted by Al-Jaridah newspaper as saying that the Islamic Republic of Iran is opposed to any insult to Kuwaiti Emir Sabah Al-Ahmad Al-Jaber Al-Sabah. His remarks came after Iran’s Foreign Ministry said it disapproves of a picture going viral in the social media that depicts a move insulting to Kuwaiti officials in the Friday’s rallies marking the victory anniversary of the Islamic Revolution, slamming the move to disseminate the image as suspicious. 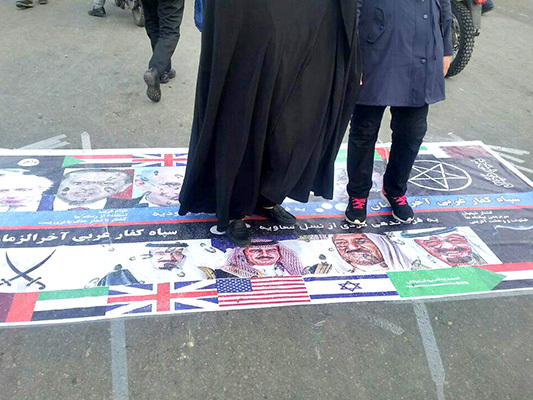 In comments on Friday evening, Foreign Ministry Spokesman Bahram Qassemi deplored the suspicious measure to disseminate such an insulting picture allegedly taken during the Friday rallies in Iran, saying it was aimed at harming relations between Iran and Kuwait. The image that insults the Kuwaiti officials and some other leaders of the neighboring countries “contains an untrue perception of this neighboring state (Kuwait),” and is rejected by the Iranian government and nation, he underlined. Qassemi noted that anti-US or anti-Israeli protests would be natural given their brazen hostility towards Iran, but the painting that was insulting to Kuwait runs counter to the “good relations” between Tehran and Kuwait City, to their “friendly and constructive” contacts, and to the goals of the Islamic Revolution that entail unity among the Muslim nations. Iran and Kuwait have developed closer political relations in recent years, and have held several sessions of a Joint Political Committee, Tasnim reported. In late January, Kuwaiti Foreign Minister Sheikh Sabah al-Khalid al-Hamad al-Sabah paid a visit to Tehran and held meetings with senior Iranian officials, including President Hassan Rouhani, who is going to visit Kuwait later today (Wednesday afternoon, February 15).